Things have started to clear up in the Big 12. Oklahoma hosted Baylor in what I said at the beginning of the season would be the conference championship game. It started to look like OU might win when they took a 14-3 lead that they held at the end of the 1st quarter. Baylor scored 45 unanswered points over the last three quarters to topple the Sooners 48-14 in Norman, behind Bryce Petty’s 387 passing yards. Trevor Knight was injured on a filthy hit in the 4th quarter, with the Bears up 41-14. A rumor is circulating that Knight experienced momentary paralysis after the hit, and his status for Saturday’s matchup at Texas Tech is uncertain at this time. Kansas won a conference game. Better yet, Clint Bowen has as many Big 12 wins as Charlie Weis did. The Jayhawks beat Iowa State at home 34-14, behind 514 yards of total offense compared to the Cyclones’ 373. Iowa State gets this week to regroup after a loss to Kansas, while KU hosts TCU. Texas is on a roll after the Longhorns knocked off West Virginia on Saturday. Texas was able to make Clint Trickett look shaky at times, but Trickett still managed 248 yards through the air. The Longhorn defense got to Trickett for three sacks on Saturday. Johnathan Gray had 3 TD’s in 101 yards rushing with Malcolm Brown adding 90, which almost matched the Mountaineers’ team total. Texas could still ruin a couple of seasons, beginning this week. TCU is in control of their own destiny after the Horned Frogs blew out Kansas State on national TV. 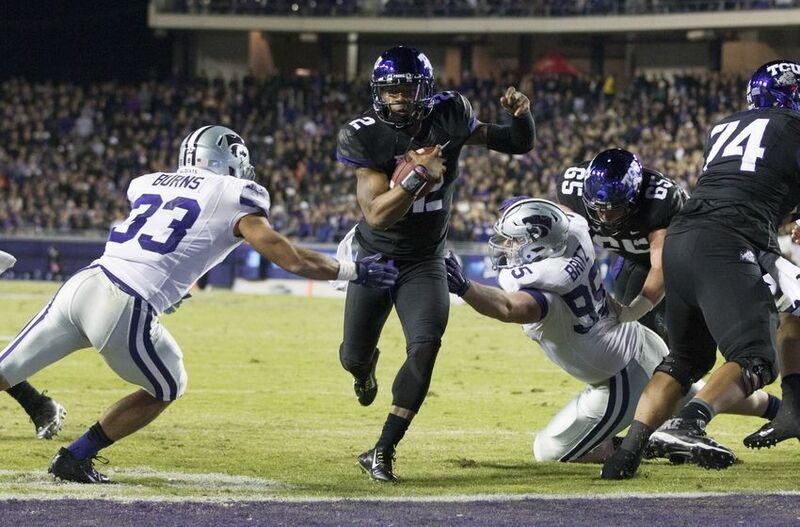 Trevone Boykin passed for 219 yards and 1 TD while rushing for 123 yards on 17 carries for 3 TD’s. Junior RB Aaron Green rushed for 171 yards on 17 carries with a TD. Jake Waters looked good at times too, with a beautiful TD pass to Curry Sexton in the 2nd quarter while racking up 291 passing yards with two TD’s and only one interception. Kansas State has not played Baylor yet, and that game could still have Big 12 Championship implications. No. 4 TCU over Kansas – Kansas is fresh off of a win over a bad Iowa State team, but TCU is good. The Horned Frogs control their playoff destiny and Big 12 Championship hopes now, and nothing about the Jayhawks looks like TCU will do anything except dominate in Lawrence on Fox Sports 1 Saturday at 2 p.m.
Oklahoma over Texas Tech – Even if Trevor Knight doesn’t play, the Sooners still look better than Texas Tech. If the Red Raiders lose this game they will officially not be bowl eligible. The Tech defense cannot tackle and they have to somehow stop Samaje Perine. This game is set for a 2:30 kick on ESPN. Texas over Oklahoma State – Texas has looked great in their last two games, a 21-point win at Texas Tech and a 16-point win at home against West Virginia. On the other hand, Oklahoma State has looked just bad in their last four outings, three of which have been losses. With the possibility of the Cowboys to beat either Baylor or Oklahoma down near zero, they must win this game to avoid breaking their streak of eight straight bowl games. Kickoff is set for 6:30 p.m. on Fox.